A unitary Belgium is doomed to fail and, in order to avoid further conflict, Belgium initiates an impressive series of state reforms. Those lead to the federal state with the very complex administrative structure that Belgium has become today. For the first time, the language situation in Brussels is laid down in law and the situation for Dutch speakers there improves steadily. The >Frenchification decreases and stagnates. Brussels remains a thorn in the side of the supporters of the >Flemish Movement who regard the ever increasing Frenchification of the Brussels metropolis and its periphery as a threat to the whole of Flemish Brabant. They are afraid that the Walloons will eventually annex this province and therefore they want to make sure the language areas are clearly demarcated. The French speakers on the other hand are rather in favour of the individual freedom of language (as stated in the original Belgian constitution). But it is exactly this ‘freedom politics’ so favoured by the French speakers, which had paved the way for the massive Frenchification of Brussels. Indeed, they are convinced of the supremacy of the French language as it is a world language and a language of culture, whereas Dutch is the coarse, unrefined language of an uneducated people. When the Flemish Movement decides to put pressure on making Brussels a truly bilingual place, where all officials would have to master both national languages, it is clear why the French speakers fear for their very comfortable positions. As a result the two camps are flatly opposed. Large demonstrations and fierce debates demand the abolishment of the >language census and the laying down of language borders. In 1962, the Flemish get their way and Belgium is officially split into four regions: a French, a Dutch, and a German-speaking area and one bilingual area, which is Brussels. As a consequence, your postcode defines the language of the local administration and all official communications. In order to lay down the language borders permanently, it is necessary to reform the constitution. This reform is done in stages. It is only in 1993 that Belgium officially becomes a federal state. 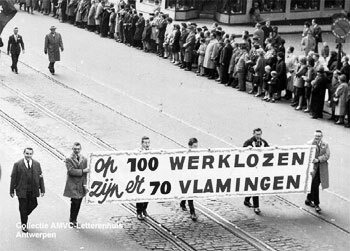 In the sixties, the Flemish economy is booming and the Flemish region becomes stronger. The traditional industries in Wallonia deteriorate and sink into poverty. The Flemish who have seats in the national government, decide to take care of Brussels and see through a number of significant changes. They manage, for example, to make it compulsory for half of all higher ranking officials in Brussels to be Flemish. This affects all government departments as well as town halls. The effect is clear; in 1963, only 11% are Dutch-speaking; in 1970, this has gone up to 28%, and in 1979, parity is reached. Because of the strong support of the Flemish, more Dutch medium schools are set up. As a result of these efforts, Dutch speakers in Brussels are given a share of the power that they would never have been able to achieve on their own. Political participation, education in their own language and all sorts of supportive structures (culture, social work, etc.) make sure that Dutch-speaking inhabitants of Brussels can now lead their lives along Dutch-speaking lines; something that would have been unthinkable before the >language laws of 1963. The outcome is that so-called bilingual Brussels is really either monolingual Dutch or monolingual French and every Brussels inhabitant walks the same >territorial language path as the Fleming and the Walloon, be it without the physical borders. This strengthening of the position of Dutch in Brussels gradually results in a stagnation of the Frenchification. While the Dutch speakers in the Capital Region acquire more rights and facilities, the Frenchification in the Flemish periphery around Brussels doesn’t stop. The so-called >facility municipalities attract more and more French speakers and well-to-do speakers of other languages, who also use French as a lingua franca. This has led to a predominantly French-speaking population in these formerly dominantly Dutch-speaking areas. As a consequence, tension rises between the Flemish and French-speaking population. Also the bordering municipalities without language facilities, such as Strombeek and Grimbergen, face growing Frenchification. Why did the council officials refuse to help Maria in either French, German of English? >Answer. From 1993, Belgium consists of 3 >regions and 3 >communities, as the map above illustrates. The communities refer to different cultural-linguistic groups in the population and their competences are so-called person-related matters, such as language, education and culture. The regions follow a more economic route and have authority in areas such as transport, energy and agriculture. The federal government keeps the responsibility for departments such as finance, defence, justice and foreign policy. Brussels has now become an autonomous economic region, but it is also the capital of the federal state of Belgium. On top of that, Flanders has - very symbolically - chosen Brussels as its capital. 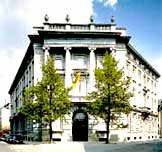 The parliament of the Flemish Community and the Flemish region have merged and have their seat in the heart of Brussels. Even though Brussels has gained autonomy in economic and logistic matters, the language situation remains complicated, because it is subject to both the Flemish and French-speaking communities and their respective policies. That is why the Brussels Capital Council consists of 17 Flemish and 72 French-speaking members of parliament, each of whom is also part of either the Flemish or the French speaking Community Committee. These figures are fixed by law. (for more on representation, see >language and politics).